General wisdom in trading says that the best executions are to be had with humans as counterparties, not computers. And by computers I mean any machine-assisted execution, not just HFTs but also the various sorts of execution algorithms. The HFTs will (probably) only be in the market when they think an order will make money and the execution algo’s are mainly used for moving large quantities of stock, so even if the algo isn’t particularly good at its job, it will still make for a pretty toxic counterparty. Humans on the other hand I’d expect to be rather imprecise with their chosen price (because it isn’t really worth their time), even more imprecise with the timing of their orders and cancellations (slowness and inattentiveness are part of being human), and be less likely to have plans to keep trading in the same direction (otherwise they’d have found somebody to help them get a good execution). So it’s reasonable that computerized traders seeking orders with little long term alpha start by thinking about how to maximize their chances of trading with humans. Probably the vast majority of manually submitted orders that ever trade are marketable – and first go to internalizers, wholesalers, and dark pools. Then, if nobody in those markets finds their terms favorable, they get sent on to the major exchanges. There, it’s extremely difficult to selectively trade with the small manual orders because of the competitive nature of the FIFO resting order queue – in order to pick out a higher proportion of favorable incoming orders, a trader has to have previously submitted their resting order before all the machines trying to do the same thing. Given how many fast and clever programs that are in the market, beating the best of them is very challenging. Knowing marketable manual orders are highly competitive, we’ll focus for now on resting manual orders. To try to identify these orders, we can just think about what they are not, HFTs. 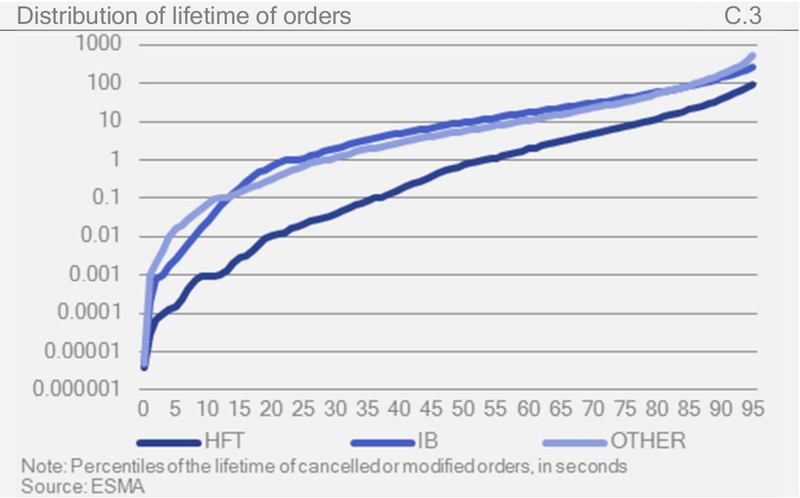 HFTs are known for their very high cancellation rates, meaning the vast majority of orders they send to market are canceled before they execute. The below chart from a recent ESMA report shows the order lifetime statistics of HFTs, investment banks, and other traders. Note that within 1 second of submission, over half of HFT orders have been canceled, but only around a quarter of non-HFTs have been. This chart comes from European data, but the general tendency should carry over to any market with a high HFT presence. With this correlation between trader type and order age in mind, let’s look at how the market price varies before and after orders of various ages execute, from the perspective of each order in question. Top panel: Average profit or loss per share vs distance in time from trade, from the perspective of the passive side of the trade. For example 30 seconds after a trade, the average Nasdaq order less than 100ms old has lost about 0.2 cents (20mils) compared to the price of the most recent 100 shares traded. The average Nasdaq order greater than 1s old has lost about 0.5 cents by the same measure. Fees and rebates are excluded. Data does not include every exchange. Bottom panel: Shares traded on Nasdaq vs time from trade (including fiducial trade). Note: There is a shaded region 1 standard deviation wide (computed naively) around each line, that is too narrow to see. 1 “mil” = 0.01 cents per share. When I first saw this effect I was surprised at its size. In the universe of algorithmic trading, a 1/4 cent difference – several times a typical HFT profit margin – is significant. It’s a pretty obvious phenomenon, too, and usually when an inefficiency is so evident the market will find a way to reduce it. One simple application I can imagine is that many liquidity-seeking execution algo’s could preferentially trade with older orders, potentially passing on a 1/4 cent cost savings to their customers. Of course that doesn’t mean it’s a big enough effect to form the basis of a profitable strategy all by itself, but as I’ll describe in the next post it does not take all that much effort to make it into one. This entry was posted in Uncategorized on January 13, 2015 by Kipp Rogers.